Who has left over Easter ham?! Just about everybody. 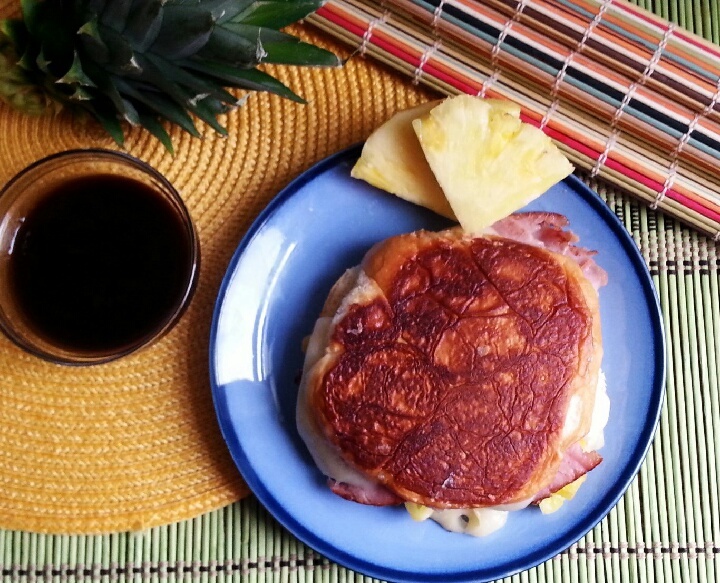 After you’ve exhausted all of your go-to, leftover ham recipes, try something unique for dinner with this awesome Hawaiian grilled cheese sandwich. It has a tropical twist and is practically perfect for brunch, lunch and hearty enough for dinner. It’s easy to throw together, has just a handful of ingredients, and tastes amazing! Combine all of the above ingredients in a small sauce pan and bring to a low simmer. It doesn’t have to cook. Just keep it warm until you are ready to serve. First, in a large skillet, warm your ham and pineapple slices through. Just about a minute on each side. Remove from pan and set aside. Next, open your Kings Hawaiian sandwich buns and butter the outside of each slice. I like to use olive oil but I’d bet coconut oil would work fantastic as well! Now it’s time to assemble the sandwiches in this order: one slice of swiss cheese, 1/4 of the ham, two pineapple slices and one more slice of cheese. The cheese being on the top and bottom will help hold the sandwich together, once it melts. Heat the same large skillet to medium. You don’t want it too hot because this sandwich is pretty thick and you want it to heat all the way through. Place the sandwiches in the skillet and cook for about 5 minutes on each side. Just until they are a nice golden brown and cheese is melted. Serve with the Big Island BBQ sauce on the side for dipping and enjoy! This entry was posted in Breakfast/Brunch, Dinner, Food, Holiday cooking, Leftovers, Munchies, Recipes, Sandwiches, Sauces and tagged BBQ sauce, Easter, grilled cheese, grilled cheese sandwich, ham, Hawaiian BBQ sauce, hawaiian grilled cheese, Hawaiian sandwich, leftover Easter ham, leftover ham, leftover ham recipes, pineapple, pineapple slices, sandwich, swiss cheese, teriyaki sauce. Bookmark the permalink. I love a good grilled cheese sandwich. I may have to try this kind. Looks and sounds yummy! I’ll have to try it!! its a good one Marsha!